Increased nitrogen enrichment and shifted patterns in the world's grassland: 1860–2016 Nitrogen input to global grassland during 1860–2016 Rongting Xu et al. Production and application to soils of manure excreta from livestock farming significantly perturb the global nutrient balance and result in significant greenhouse gas emissions that warm the earth's climate. Despite much attention paid to synthetic nitrogen (N) fertilizer and manure N applications to croplands, spatially explicit, continuous time-series datasets of manure and fertilizer N inputs on pastures and rangelands are lacking. We developed three global gridded datasets at a resolution of 0.5∘ × 0.5∘ for the period 1860–2016 (i.e., annual manure N deposition (by grazing animals) rate, synthetic N fertilizer and N manure application rates), by combining annual and 5 arcmin spatial data on pastures and rangelands with country-level statistics on livestock manure, mineral and chemical fertilizers, and land use information for cropland and permanent meadows and pastures. Based on the new data products, we estimated that total N inputs, the sum of manure N deposition, manure N application and fertilizer N application to pastures and rangelands, increased globally from 15 to 101 Tg N yr−1 during 1860–2016. In particular during the period 2000–2016, livestock manure N deposition accounted for 83 % of the total N inputs, whereas manure and fertilizer N application accounted 9 % and 8 %, respectively. At the regional scale, hotspots of manure N deposition remained largely similar during the period 1860–2016 (i.e., southern Asia, Africa and South America); however, hotspots of manure and fertilizer N application shifted from Europe to southern Asia in the early 21st century. The new three global datasets contribute to the filling of the previous data gaps of global and regional N inputs in pastures and rangelands, improving the abilities of ecosystem and earth system models to investigate the global impacts of N enrichment due to agriculture, in terms of associated greenhouse gas emissions and environmental sustainability issues. Datasets are available at https://doi.org/10.1594/PANGAEA.892940. Xu, R., Tian, H., Pan, S., Dangal, S. R. S., Chen, J., Chang, J., Lu, Y., Skiba, U. M., Tubiello, F. N., and Zhang, B.: Increased nitrogen enrichment and shifted patterns in the world's grassland: 1860–2016, Earth Syst. Sci. Data, 11, 175-187, https://doi.org/10.5194/essd-11-175-2019, 2019. Livestock production has increased substantially in response to growing meat consumption across the globe in the past century (Bouwman et al., 2013; Dangal et al., 2017). Agriculture occupies 37 % of earth's ice-free land surface for use as cropland and “permanent meadows and pastures” (Tubiello, 2018). Land used by livestock for permanent meadows and pastures is the largest component, using 25 % of the total land earth surface (FAOSTAT, 2018) to generate 33 %–50 % of world total agricultural GDP (Herrero et al., 2013). While livestock is a major source of income for more than 1.3 billion people, it is also a major user of crop and freshwater resources (Dangal et al., 2017; Herrero et al., 2013). Overall, livestock production plays a major role as a driver of global change in land use and nutrient cycles (Havlík et al., 2014; Herrero et al., 2013; Zhang et al., 2017). There is a growing recognition that livestock production is linked to increasing global greenhouse gas (GHG) and ammonia emissions (Tian et al., 2016; Tubiello et al., 2018; Xu et al., 2018, 2019). Unsustainable practices, especially in intensive systems, may lead to severe pollution of aquatic systems and soil degradation locally, regional and globally, in particular through nitrate leaching to water bodies (Dangal et al., 2017; Davis et al., 2015; Fowler et al., 2013; Yang et al., 2016). Growing global demand for livestock products has increased grain production for feed in many regions, and has become a global driver of fertilizers trends, through an increase in manure availability and synthetic fertilizer N use (FAOSTAT, 2018). Livestock production systems therefore play an important role in global nutrient cycles. For example, nitrogen excretion from livestock increased from 21 Tg N yr−1 in 1860 to 123 Tg N yr−1 in 2016 (FAOSTAT, 2018; Zhang et al., 2017). Livestock contribute roughly two-thirds of non-CO2 GHG emissions from agriculture (Smith et al., 2014), with roughly an equal share of CH4 and N2O emissions (Dangal et al., 2017; Tubiello et al., 2013). Importantly, about 45 % of total anthropogenic N2O emissions are linked to manure deposited through grazing and manure applied to croplands or left on pasture (Davidson, 2009; FAOSTAT, 2018). Globally, emissions from manure N applied to soils or left on pastures increased from 0.44 to 0.88 Gt CO2eq. yr−1 during 1961–2010 (FAOSTAT, 2018). Increased meat and dairy product consumption worldwide was a major driver behind the documented increase in cattle herds globally (FAOSTAT, 2018), and thus a major cause in the observed atmospheric increase of N2O and CH4 over the past several decades (Bai et al., 2018; Bouwman et al., 2013; Dangal et al., 2017; Tubiello, 2018). While the availability of national-level statistics is a fundamental component of our knowledge base, environmental problems related to nitrogen pollution or emissions are best tackled at the local scale and often require finer, geospatial information, for example to assess proximity to water bodies and thus pollution risks. In particular, a number of studies have focused on downscaling existing national information to develop geospatially explicit regional and global datasets of nitrogen fertilizer and livestock manure production and use, to better understand their feedback on the climate system. Several datasets of N fertilizer use were used in this study, in particular the FAOSTAT annual, country-specific statistics on mineral and chemical fertilizers and livestock manure over the period 1961–2016 (FAOSTAT, 2018), as well as specific geospatially downscaled products (e.g., Bouwman et al., 2005; Lu and Tian, 2017; Mueller et al., 2012; Nishina et al., 2017; Potter et al., 2010; Sheldrick et al., 2002). Further, global manure production datasets were developed in different studies to achieve various research goals (Bouwman et al., 2009, 2013; Holland et al., 2005; Potter et al., 2010; Zhang et al., 2017). Although datasets of manure application in croplands are increasingly becoming available, there is considerable uncertainty in the estimation of total manure application and their spatial distribution across different studies (Gerber et al., 2016; Herrero et al., 2013; Liu et al., 2010; Zhang et al., 2017). Although previous studies have provided spatially explicit datasets of N inputs in the form of mineral or chemical and manure N in cropland systems, the spatially explicit datasets on N inputs in grassland systems are still missing (Chang et al., 2016; Lassaletta et al., 2014; Stehfest and Bouwman, 2006). By grassland systems we mean the FAO livestock land use definition, i.e., land used as permanent meadows and pastures (FAOSTAT, 2018). The same may also be referred to in the literature as “pastures and rangelands”. We note that “grassland” is in fact a land cover definition. In order to avoid the confusion often made in the literature between land cover and land use terminology, we will adopt FAO land use terminology of permanent meadows and pastures, to which the various national regional and global land use statistics cited in this work refer. Furthermore, using results from the HYDE 3.2 dataset (Klein Goldewijk et al., 2017), we may split the FAO land use category into “pastures” and “rangelands”, to highlight differences between managed intensive and unmanaged extensive systems, as needed. To enhance our understanding of the role of livestock in the global GHG balance and nutrient budgets (e.g., ammonia emissions, nitrate leaching), global biogeochemistry models require spatially explicit estimates of N inputs. In this study, we developed datasets for major sources of N inputs in agriculture (i.e., manure and fertilizer application and manure deposition on permanent meadows and pastures), using the recently published FAOSTAT statistics on manure N use in agriculture (FAOSTAT, 2018). The latter are estimates based on IPCC Tier 1 methodology; i.e., they rely on default coefficients prescribing, among other variables, N excretion rates by animal type and region, as well as regional compositions of manure management systems (FAOSTAT, 2018). Through combining the land use dataset HYDE 3.2, FAOSTAT fertilizer N statistics and gridded manure production data in Zhang et al. (2017), we developed three annual global datasets at a spatial resolution of 0.5∘ × 0.5∘, as follows: (1) manure N application rates to pastures (1860–2016); (2) synthetic N fertilizer application rates to pastures (1961–2016); and (3) manure deposition rates by grazing livestock to rangelands and pastures (1860–2016). We quantified regional variations in N inputs, identified hotspots of N inputs from different N sources from livestock and discussed their uncertainty. 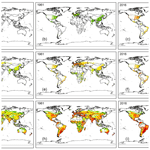 These datasets are developed for global model simulation studies in model intercomparison projects (e.g., NMIP; Tian et al., 2018, 2019), and will be updated annually based on regular annual updates of FAO fertilizers and land use statistics and other sources of data such as global land use data products. The concepts of grassland, pastures and meadows span several international land cover and land use statistical definitions, specifically those used by FAO (FAOSTAT, 2018). In this paper, we follow the relevant FAO land use definition of permanent meadows and pastures, considering our focus on livestock production. Importantly, complete country, regional and global statistics available from FAO refer to this land use category. This land use definition is roughly equivalent to the one adopted by the academic community engaged in global biogeochemical modeling, for which “grassland systems” are thought of as land cover/land use areas dominated by herbaceous and shrub vegetation, including savannas (Africa, South America and India), steppes (Eurasia), prairies (North America), shrub-dominated areas (Africa), meadows and pastures (United Kingdom and Ireland) and tundra (Breymeyer, 1990; White et al., 2000). For mineral and chemical fertilizers, we further split the FAO definition using HYDE 3.2, into pastures and rangelands, the former representing land use areas managed to support high stocking densities of grass production for hay and silage, whereas the latter represents unmanaged and grazed at low stocking densities. Although FAOSTAT land use statics cover in principle these two subcategories of land use, data coverage needed is insufficient for the consistent global mapping needed herein. The spatial distribution map of pastures and rangelands provided by HYDE are nonetheless based on and normalized to FAOSTAT land use statistics, complemented by additional information (Klein Goldewijk et al., 2017). To investigate N inputs from livestock at a regional level, the global landmass was disaggregated into seven regions: North America, South America, Africa, Europe, southern Asia (i.e., west, south, east, central and southeast Asia), northern Asia and Oceania (Fig. S1 in the Supplement). We obtained national-level datasets of “Agricultural use of mineral or chemical fertilizers” from the FAOSTAT (2018) “Fertilizers by Nutrient” domain, over the time series 1961–2016. The FAOSTAT statistics of agricultural use include use for both agriculture and forestry, as well as use in aquaculture. Furthermore, agricultural use includes both cropland and permanent meadows and pastures. We assumed that the use of fertilizers for forestry and aquaculture was zero, as well as fertilizer applications on rangelands. Subsequently, we estimated N application rates to pastures by using the ratio of pasture to cropland N use total published by Lassaletta et al. (2014). We finally spatialized the pasture N data using HYDE 3.2, obtaining gridded maps of synthetic fertilizer N application rates on pastures in each grid cell area, over the period 1961–2016 (Fig. 1). We assumed even application rates within each country. Although gridded livestock density maps were available from FAO, these are currently fixed for specific time periods, mainly 2010, so that we deemed their use not particularly relevant to improve estimates for the 1961–2016 time series considered herein. Improved live density map products from FAO will considerably improve our work and reduce uncertainty, and will be used when available. Figure 1Diagram of the workflow for developing the database of global annual N fertilizer use rate in pasture during the period 1961–2016. We obtained country-level datasets of “manure applied to soils” from the FAOSTAT (2018) “Livestock Manure” domain for the period 1961–2016 (FAO, 2018). Following IPCC guidelines, the data in this domain do not consider N leaching during treatment (FAOSTAT, 2018). Furthermore, the FAOSTAT data do not separate manure application to cropland and pastures, and data of manure N application rates to pastures are currently not available. We therefore assumed that manure N application rates in pastures and croplands were the same, considering that the overall uncertainty in the input manure N data would not justify further assumptions at this stage of knowledge. Improved FAO statistics on both use and application rates will be used when available to improve this current work. Through combining land use data HYDE 3.2, we calculated the total cropland and pasture areas within each country where manure application amount was larger than zero. We then computed mean manure N application rates on pastures, annually over the period 1961–2016 (Fig. 2). 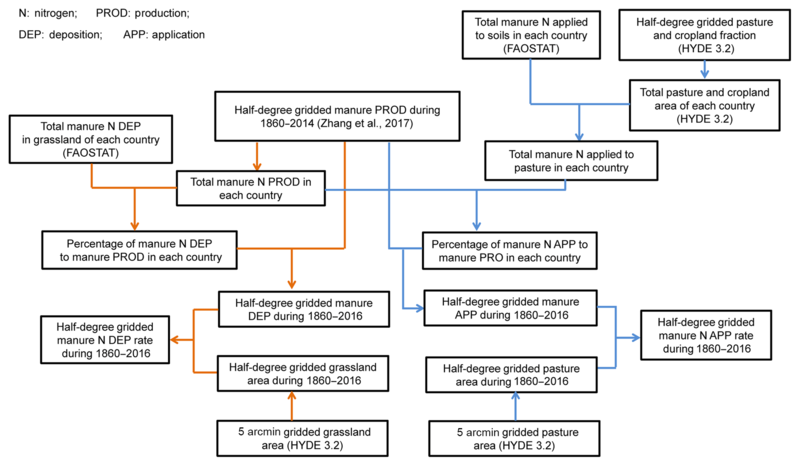 Figure 2Diagram of the workflow for developing the database of global annual manure N use rate in pastures and manure N deposition rate in pastures and rangelands during the period 1860–2016. We calculated the national-level ratio of manure application to production (Ra2py,j) by combining gridded manure production data in Zhang et al. (2017) and the grid cell area. To spatialize the national-level manure N application amounts to gridded maps of application rates in each grid area, we multiplied the Ra2py,j in grids where pasture areas were larger than zero with the time-series gridded spatial distribution maps of manure production rate in Zhang et al. (2017) during 1961–2014 and based on the spatial distributions of global pastures in land use data HYDE 3.2 (Klein Goldewijk et al., 2017). where year is from 1961 to 2016, and country number is 165. Ra2py,j is the ratio (unitless) of manure application to production in the year y and country j. TMappy,j is the national total manure application amount (kg N yr−1) derived from the FAO database for each year. Ag is the area of each grid (km2). where RMappy,g is the gridded manure application rate (kg N km−2 yr−1) in year y and country j. As the national-level manure application amount was not available during 1860–1960, we assumed that Ra2py,j is the same as for 1961. Combining with the gridded spatial maps of manure production rates in Zhang et al. (2017), we generated the datasets of spatialized manure application rates to global pastures during 1860–1960. 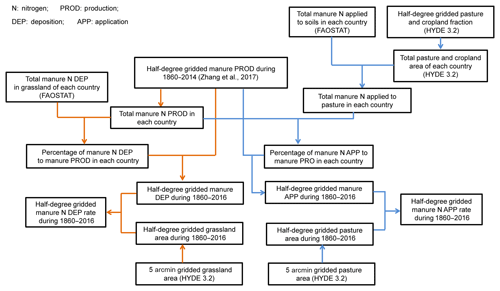 Finally, we calculated manure application amounts in each country by combining RMappy,g and grid areas to compare with national-level deposition amounts from the FAOSTAT database during 1961–2016. As we calculated national-level manure application amounts during 1860–1960 using Ra2py,j in 1961, these data served as national total manure N application amounts to adjust RMappy,g during 1860–1960. where Ray,j is the regulation ratio (unitless) in the year y and country j.
where RMappy,g(r) is real gridded manure application rate (kg N km−2 yr−1) in the year y and country j. To develop global distribution maps of manure N deposition by grazing animals, we first obtained country-level statistics of “manure left on pasture” over the period 1961–2016 from the FAOSTAT (2018) “Livestock manure” domain of FAOSTAT agri-environmental indicators (FAO, 2018). 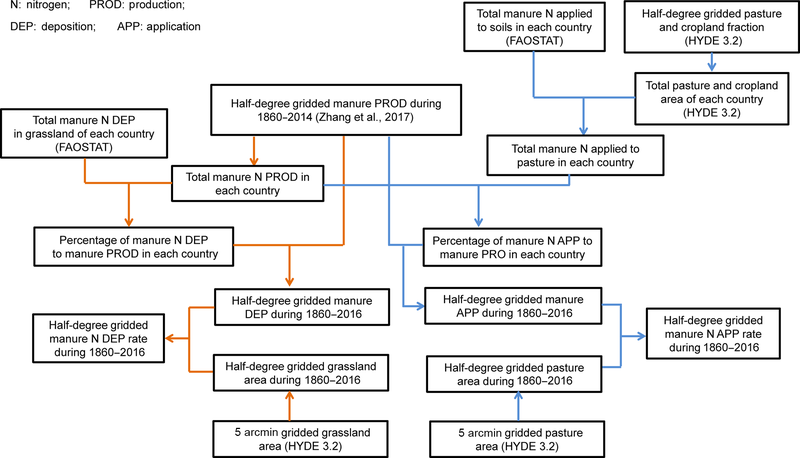 We then obtained the national-level ratio of manure deposition to production (Rd2py,j) by combining country-level FAOSTAT datasets of manure left on pasture and gridded total manure production datasets based on Zhang et al. (2017). Then, we used spatial distributions of global permanent meadows and pastures, including pastures and rangelands, based on HYDE 3.2 grassland data (Klein Goldewijk et al., 2017) and gridded maps of deposition rates, to spatialize the national-level manure N deposition at the global scale. For example, we multiplied the Rd2py,j ratio in grids within which the pastures and rangelands area was larger than zero, with the time-series gridded spatial distribution maps of manure production rates in Zhang et al. (2017) during 1961–2014 (Fig. 2). where year (y) is from 1961 to 2016 and country number (j) is 157. Rd2py,j is the ratio (unitless) of manure deposition to production in the year y and country j. TMdepy,j is national total manure deposition amount (kg N yr−1) derived from the FAOSTAT database for each year. RMprody,g is the gridded manure N production rate (kg N km−2 yr−1) in the year y and grid g.
where RMdepy,g is the gridded manure deposition rate (kg N km−2 yr−1) in the year y and country j.
where CTMdepy,j (kg N yr−1) is the calculated national-level manure deposition amount in the year y and country j. If CTMdepy,j is less or more than TMdepy,j, an adjustment was made to keep calculated national total amounts consistent with those from the FAOSTAT database. In this case, CTMdepy,j is roughly equal to TMdepy,j using Eq. (8); thus no adjustment was needed. Since the national-level manure deposition amounts are not available during 1860–1960, we assumed that Rd2py,j is the same as that in 1961. Combining the gridded spatial maps of manure production rates in Zhang et al. (2017), we generated datasets of spatialized manure deposition rates on permanent meadows and pastures globally for the period 1860–1960. The FAO data, combined with the geospatial analysis in this work, show that the total amount of synthetic N fertilizer applied to pastures increased from 0.04 to 8.7 Tg N yr−1 during 1961–2016 at an average rate of ∼0.18 Tg N yr−1 (R2=0.98) (Fig. 3a). Synthetic N fertilizer application rates showed rapid increases across the globe, with large spatial variations during the study period (Fig. 4b–c). The global average application rate on pastures was 0.07 kg N ha−1 yr−1 in 1961 and reached 10.9 kg N ha−1 yr−1 in 2016 (increased ∼154-fold) (Table 1). 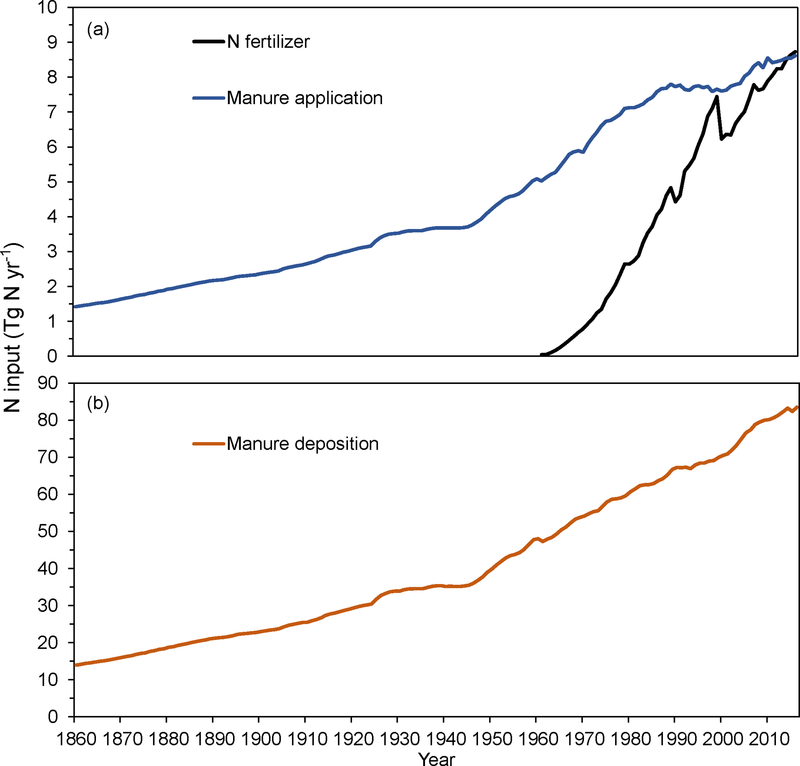 Figure 3Temporal patterns of global manure N use, N fertilizer use and manure deposition in grassland systems: (a) manure N use and N fertilizer use on global pastures during 1860–2016 and during 1961–2016, respectively, and (b) manure N deposition to global pastures and rangelands during 1860–2016. Table 1The N input rates, applied/deposited area and total amounts in global pastures and rangelands in 1860, 1961, 1980, 2000 and 2016 (1 km2=100 ha). N/A: not available. In the 1960s, Europe (0.2 Tg N yr−1) was the largest contributor (67.8 %) to the total global N fertilizer use, followed by North America (0.06 Tg N yr−1, 21.8 %) and southern Asia (0.03 Tg N yr−1, 9.9 %) (Fig. 5a). The remaining regions accounted for less than 1 % of the total N fertilizer application. During 1961–2016, southern Asia showed a continuous increase of N fertilizer consumption and became the largest contributor (3.4 Tg N yr−1, 45 %) between 2000 and 2016. In contrast, Europe's synthetic N fertilizer use and contribution to the global total has decreased since the 1980s (Fig. 5a). This is a well-known trend, linked to EU-wide policy directives aimed at minimizing N pollution (Tubiello, 2018). During 2000–2016, Europe applied 2.1 Tg N yr−1, which accounted for 27 % of the total global N fertilizer use on pastures. There was a slight increase in the contribution from North America, and the synthetic fertilizer N use amount increased by 1.6 Tg N yr−1. The remaining regions accounted for roughly 7 % of the total N fertilizer application on pastures. The average synthetic N application rate in Oceania, North America and southern Asia showed a rapid increase over the period 1961–2016 (Fig. 5d). Africa and northern Asia showed a slight increase in average N fertilizer application rates during the study period. Europe exhibited a rapid increase of N fertilizer application rates from 1961, then these decreased after 2000 and have started to increase in the last 5 years (Fig. S3). We identified the top five countries (India, United States, China, France and Germany) with the highest fertilizer N application to pastures in 2016. These countries consumed 49 % to 58 % of the total N fertilizer from 1961 to 2016. India (1.5 Tg N yr−1) and the United States (1.5 Tg N yr−1) were the two largest contributors in 2016, at an increasing rate of 45 Gg N yr−1 (R2=0.98) during 1980–2016 and 32 Gg N yr−1 (R2=0.99) during 1961–2016, respectively. China consumed 1.4 Tg N yr−1 in 2016 at an increasing rate of 34 Gg N yr−1 (R2=0.96) during 1977–2016, while there was only a slight increase during 1961–1976. In contrast, fertilizer N use in France peaked in 1999 (0.8 Tg N yr−1), then showed a rapid decrease until 2016 (0.5 Tg N yr−1). Similarly, in Germany, it peaked in 1988 (0.8 Tg N yr−1), and showed a continuous decrease until 2016 (0.3 Tg N yr−1). Our results showed that the annual manure N application rates on pastures increased from 1.4 to 8.6 Tg N yr−1 during 1860–2016 (Fig. 3a). Manure N application rates showed rapid increases across the globe and exhibited large spatial variations, shifting the regional use from North America and Europe to Asia during the study period (Fig. 4d–f). The global average manure application rate was 5.3 kg N ha−1 yr−1 in the 1860s and roughly doubled by 2016 (10.7 kg N ha−1 yr−1) (Table 1). 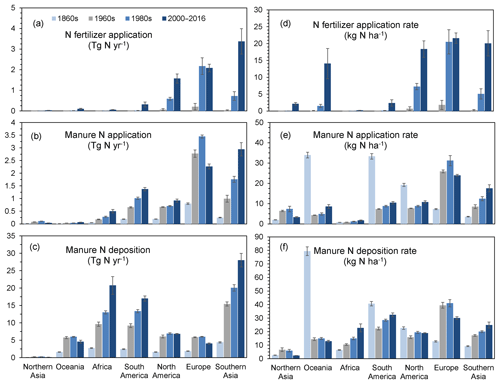 Figure 4Spatial patterns of N input rates in global pastures and rangelands in 1860, 1961 and 2016: (a, b, c) N fertilizer application rates, (d, e, f) manure N application rates and (g, h, i) manure N deposition rates. From the regional perspective (Fig. 5b), in the 1860s Europe (0.8 Tg N yr−1) was the largest contributor and accounted for 53 %, while southern Asia (0.25 Tg N yr−1) accounted for 17 % of the global total manure N application on pastures. South and North America shared the same proportion (13 %), whereas the remaining regions only shared 4 %. Conversely during 2000–2016, manure N application on pastures in southern Asia (2.9 Tg N yr−1) was 10-fold higher than that in the 1860s and accounted for 36 % of the global total, surpassing Europe, which accounted for 28 % of the global total. Manure N application amounts in North America and South America increased, but with different magnitudes. During 2000–2016, North America accounted for 11 %, while South America accounted for 17 % of the global total. In the remaining regions, significant increases of annual manure N application on pastures also occurred, but their contributions to the global total changed only slightly (8 %) compared to the 1860s. Figure 5Nitrogen fertilizer use (a) and rate (d), manure N use (b) and rate (e) and manure N deposition (c) and rate (f) at regional scales in the 1860s, 1960s, 1980s and 2000–2016. Error bars represent standard deviation within each decade. The regional average manure N application rate was increasing in southern Asia and Africa during 1860–2016 (Fig. S3b). 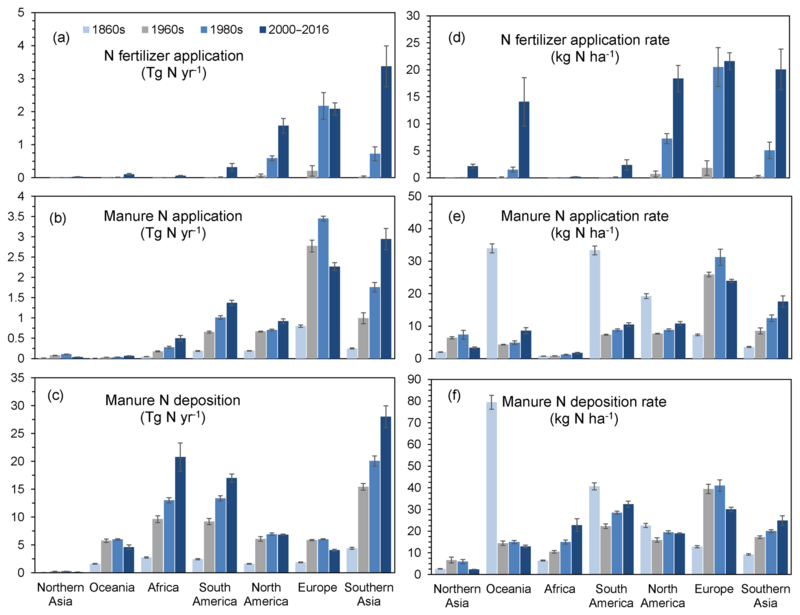 South America, Oceania and North America exhibited a rapid decreasing trend of manure N application rates from the 1860s to the 1960s and showed continuous increases afterward until 2016 (Figs. 5e, S3b), which was associated with the substantial expansion of pasture areas (Table S2). Europe exhibited a rapid increase of manure N application rates from the 1860s, then these decreased after the 1980s (Figs. 5e). In 2016, the top five countries with largest manure N applications on pastures were China, United States, Brazil, Russia and France. Manure N application in these countries contributed 43 % to 52 % of global total use from 1961 to 2016. China (2.5 Tg N yr−1) alone accounted for 30 % in 2016 at an increasing rate of 42 Gg N yr−1 (R2=0.98) during 1961–2016. Manure N use on pastures in Brazil and the United States was roughly the same (0.7 Tg N yr−1) in 2016. Both countries showed a slower increasing trend (Brazil 7 Gg N yr−1 and United States 3 Gg N yr−1) during 1961–2016. In contrast, Russian manure N application peaked in 1989 (0.7 Tg N yr−1), then showed a rapid decrease until 2016 (0.3 Tg N yr−1). Similarly, in France, it peaked in 1979 (0.45 Tg N yr−1), then showed a continuous decrease until 2016 (0.28 Tg N yr−1). Our data show that the total amounts of manure N deposited on pastures and rangelands increased from 14 to 84 Tg N yr−1 during 1860–2016 (Fig. 3b). Manure N deposition rates increased steeply across the globe, but exhibited large spatial variations during the study period (Fig. 4g–i). The increase was much larger in the eastern world (typically China and India) and South America compared to the western world. The global average manure deposition rate was 11 kg N ha−1 yr−1 in 1860 and reached 25 kg N ha−1 yr−1 in 2016 (Table 1). At the regional scale (Fig. 5c), in the 1860s southern Asia was the region with the largest manure N deposition on pastures and rangelands (4.4 Tg N yr−1; 30 % of total manure N deposition amounts), followed by Africa (2.8 Tg N yr−1; 19 %) and South America (2.4 Tg N yr−1; 16 %). Manure N deposition in the remaining regions was estimated to be 5.1 Tg N yr−1, contributing 35 % to the total manure N deposition amount. During 2000–2016, southern Asia, Africa and South America were still the three largest contributors: 27 Tg N yr−1 accounted for 34 %, 20 Tg N yr−1 accounted for 26 % and 15 Tg N yr−1 accounted for 20 % of the global manure N deposition on pastures and rangelands, respectively. The remaining regions (Oceania, North America and Europe) contributed to 20 % of the global total during 2000–2016. 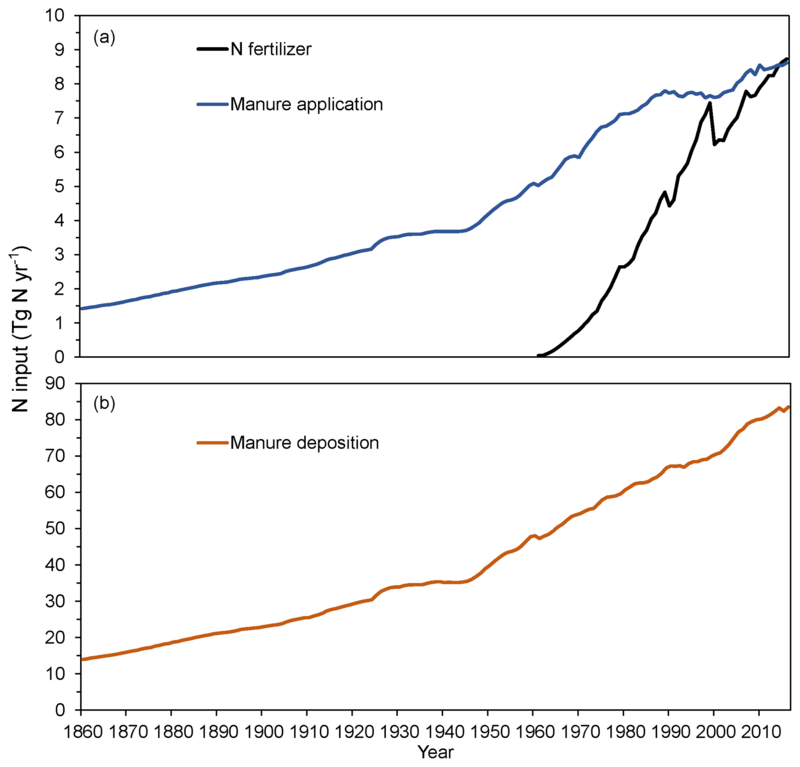 Europe and Oceania saw an increase in manure N deposition amounts from 1860 to 1960, but since 1980 there has been a significant decrease, partly explained by the onset of N pollution regulation. Manure N deposition amounts in North America increased during 1860–1980, but changed slightly from 1960. Oceania showed a continuously decreasing trend of average manure N deposition rates in pastures and rangelands over the period 1860–2016. Manure N deposition rates in South America decreased between 1860 and 1960 and then increased afterward until 2016 (Fig. S3c). The significant contrast of changes in manure N deposition rates in Oceania and South America between the 1860s and the 1960s is due to the substantial and rapid increase of grassland areas (Tables S2, S3). 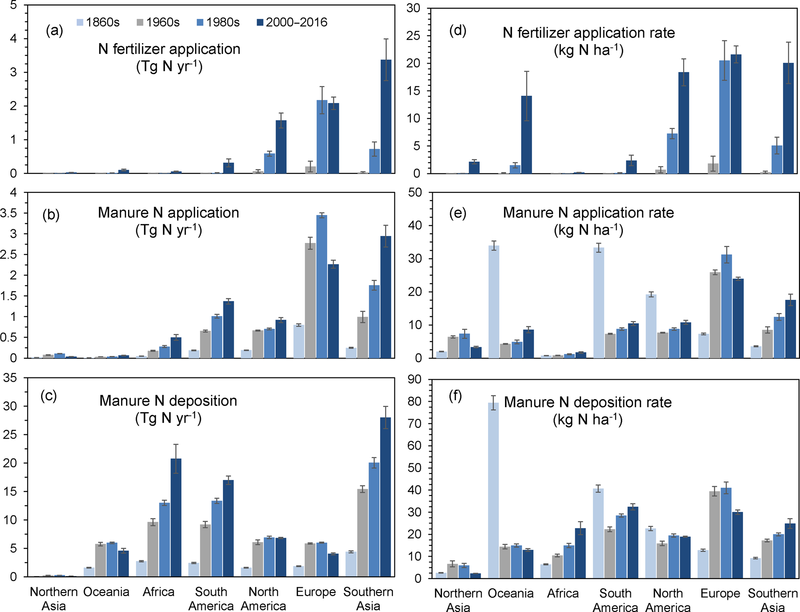 Africa and southern Asia saw continuous increases in manure N deposition rates from 1860 to 2016, whereas Europe and North America were found to have decreasing deposition rates from the 1980s (Figs. 5f, S3c). In this study, we identified the top 10 countries (China, Brazil, India, Ethiopia, United States, Australia, Sudan (former), Pakistan, Argentina and Nigeria) that together contributed to 48 % of the global total manure N deposition on pastures and rangelands in 2016. Among these countries, China (17 %) and Brazil (21 %) were the two largest contributors, with the similar annual rate of increase of ∼125 Gg N yr−1 (R2=0.99) during 1961–2016. India was the third largest contributor, however, at a small increasing rate of 63 Gg N yr−1 (R2=0.98) during 1961–2016. Annual manure N deposition in Ethiopia PDR was stable during 1961–2000, but since then rapidly increased at a rate of 117 Gg N yr−1 (R2=0.96). The United States showed a significant increase of annual manure N deposition on pastures and rangelands from 1961 to 1975 and then was stable after 1980. Australia showed a decreasing trend during 1990–2016 at a rate of 62 Gg N yr−1 (R2=0.92), whereas in the former Sudan, Pakistan and Nigeria annual manure N deposition amounts to pastures and rangelands increased at an annual average rate of 68 (R2=0.8), 46 (R2=0.97) and 56 (R2=0.98) Gg N yr−1, respectively. There was no significant change in manure N deposition amounts in Argentina; the annual deposition from 1961 to 2016 was 2.6 Tg N yr−1. The global N cycle has been significantly perturbed by human activity since at least the industrial revolution. Intense agricultural activities, such as synthetic N fertilizer production and use, and intensive livestock production, were identified as major drivers of such change. In this context, improving estimates of global anthropogenic N inputs to pastures and rangelands and their consequences, including on N2O emissions, is important (Galloway et al., 2008; Tian et al., 2016; Xu et al., 2017). In this study, we generated global datasets of fertilizers N inputs from livestock, both synthetic and from manure, during the period 1860–2016. Pastures and rangelands experienced substantial land expansion over the period of 1860–1998 (Klein Goldewijk et al., 2017). The total amount of mineral and manure N applied to permanent meadows and pastures increased by 573 % over the study period, from 15 to 101 Tg N yr−1 from 1860 to 2016. During 2000–2016, the global mineral N fertilizer application to agriculture was significant, reaching 110 Tg N yr−1 in 2016, while manure N production was 123 Tg N yr−1 (FAO, 2018; FAOSTAT, 2018), resulting in a total input of 233 Tg N yr−1. Our estimate of total N inputs (synthetic N fertilizer: 7.5 Tg N yr−1; manure N application: 8.2 Tg N yr−1; manure N deposition: 78.1 Tg N yr−1) to permanent meadows and pastures (93.8 Tg N yr−1) accounted for 45 % of global total N production (manure 114.2 Tg N yr−1; synthetic N fertilizer 96.4 Tg N yr−1) during 2000–2016. Our work extends the relevant FAO national-level statistics in order to provide input drivers for process-based model simulations (e.g., NMIP; Tian et al., 2018, 2019). We furthermore separated N application rates between pastures and cropland, based on previous published work. We likewise extended information available in FAOSTAT by providing spatialized manure N application rates to pastures and a spatialized national-level manure N deposition dataset from 1860 to 2016. We compared our datasets with other existing data sources (Table 2). Our estimate of world total manure N use on pastures was 58 % and 171 % higher than that estimated by Stehfest and Bouwman (2006) and Liu et al. (2010), respectively. However, our estimate was 39 % and 87 % lower than estimates by Bouwman et al. (2002, 2013, respectively). Critically, pasture area data varied significantly across different studies. For example, Bowman et al. (2013) divided grasslands into mixed and pastoral systems, and estimated grasslands area based on the country- or regional-level grazing intensity (Table 2). In addition, synthetic fertilizers were applied to the area of mixed agricultural systems (grassland and cropland) and manure N was assumed to be applied to both mixed and pastoral systems. The HYDE 3.2 land use dataset divides the global grazing area into intensively managed grasslands (pastures), and less intensive and unmanaged grasslands (rangelands) (Klein Goldewijk et al., 2017). In this study, we rather assumed that all manure N was applied to pastures, the latter estimated from the HYDE database (798 Mha). Hence, pasture area defined in Bowman et al. (2013) was more than 4-fold higher than the data we used. Consequently, the spatial distribution and annual total N application differed substantially compared with that in Bowman et al. (2013). Table 2Comparison of manure and fertilizer N application amounts between this study and published datasets. N/A: not available. a Estimated in 1995. b National-level fertilizer data for 1998. The total grassland area for N fertilizer and manure was 677 Mha. c Estimated in 2000. d The grassland area includes both mixed and patrol systems. Similarly, the estimates of N fertilizer use in pastures showed large variations across studies (Table 1). This study obtained country-level N fertilizer amounts applied to pastures from the national-level ratios provided by Lassaletta et al. (2014) and total N amounts applied to soils provided by FAOSTAT. Thus, the global N fertilizer amount in 2000 was consistent with that in Lassaletta et al. (2014). Liu et al. (2010) assumed that 16 % of fertilizer was applied to global grasslands. Their estimate was roughly twice as high as this study (6.2 Tg N yr−1) for the year 2000. The estimates by Bowman et al. (2002) and Stehfest and Bouwman (2006) were 31 % and 50 %, respectively, lower than our estimates in the corresponding years. Klein Goldewijk et al. (2017) divided land used for grazing into more intensively used pastures, less intensively used or unmanaged rangelands. In this study, we assumed N fertilizer was applied to all global pastures and therefore the total area of intensively managed grassland was significantly different from the area used in Bowmann et al. (2002) and Chang et al. (2016). Overall, southern Asia ranks as a top hotspot of all sources of global N inputs in pastures and rangelands during the past three decades, causing a major threat to environmental sustainability and human health in this region. In the 1860s overall manure N production amounts were similar in Asia and Europe (Zhang et al., 2017). However, manure N deposition was 2.4 times higher than that in Europe, whereas manure N application was roughly 3 times lower than that in Europe. During 2000–2016, southern Asia accounted for ∼42 % of global manure N production. Consequently, manure N deposition and application amounts in southern Asia were the highest compared to the rest of the regions between 2000 and 2016. These increases are due to large increases in animal numbers (e.g., cattle, sheep and goats) since 1950 (Bouwman et al., 2013; Dangal et al., 2017). For the rest of the regions, the increases of livestock numbers were also found in South America and Africa from 1860, whereas livestock numbers in Europe and North America showed a decreasing trend after 1980 (Dangal et al., 2017). Thus, besides southern Asia, South America and Africa were hotspots for manure N deposition during 1860–2016, while manure N deposition amount has decreased in Europe and North America since the 1980s. European countries (e.g., Germany, United Kingdom and Ireland) were identified as top hotspots of global N fertilizer application in 1961 (Fig. 4b). However, these hotspots have shifted from western Europe towards southern Asia at the end of the 20th century (Fig. 4c). Southern Asia was found with the highest N fertilizer application amounts between 2000 and 2016, most concentrated in countries of eastern and southern Asia (e.g., China and India). China and India together applied 36 % of global total N fertilizer to pastures and rangelands. Manure application hotspots have moved from European countries to southern Asia since the 2000s. 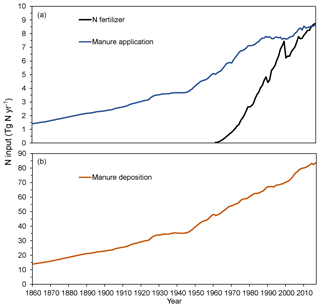 Between 1860 and 1999, Europe accounted for 50 % of global total manure N application to pastures and experienced a rapid growth of manure N application, peaking (3.5 Tg N yr−1) in 1986. In 1860, the highest applications were in the United Kingdom, France and Germany (Fig. 4d), but by 2016, the highest application was in the North China Plain (Fig. 4f). China alone applied 29 % of global total manure N during 2000–2016. Southern Asia, as the hotspot of manure N deposition to pastures and rangelands, has contributed 31 % of the global total amount during the past 157 years. Also, in Africa and South America substantial increases of manure N deposition during 1860–2016 were observed. In the 1860s, manure N deposition from southern Asia, Africa and South America contributed to 65 %, whereas Europe accounted only for 12 % of the global total manure N deposition. In 1860, the highest deposition rates were observed for New Zealand, Australia and western Europe (Fig. 4g). In 2016, except for the above-mentioned regions, the highest deposition rates were in southern and western Asia, China, western and eastern Africa and South America (Fig. 4i). During 2000–2016, manure N deposition from southern Asia, Africa, and South America contributed to 80 %, while Europe accounted for 5 % of the global total amount. This study attempts to provide an overall estimate of N inputs to global rangelands and pastures during the period 1860–2016. However, before these data are used in global models, uncertainties of these datasets need to be addressed. First, the different definitions of grassland systems used by the scientific community introduce uncertainties of the spatial patterns and annual total amounts of N inputs. Chang et al. 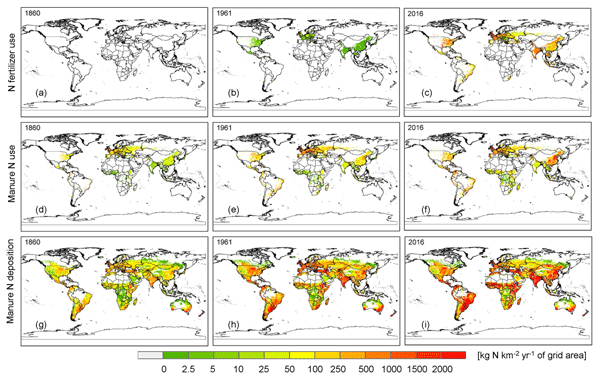 (2016) generated global maps of grassland management intensity from 1901 based on modeled net primary production and the use of grass biomass generated by Herrero et al. (2013). Their total grassland area substantially differed from pasture area developed by HYDE 3.1 (Chang et al., 2016). In this study, we used HYDE 3.2 to generate N inputs to global grasslands, defined more appropriately by using the FAO land use definition of permanent meadows and pastures. This dataset exactly followed the FAOSTAT data during 1960–2015, and combined population density data to reconstruct land use prior to 1960. Pastures and rangelands defined in HYDE 3.2 were based on the intensity of human management. Although Bouwman et al. (2013) indicated that grassland areas in their study were also calculated based on the grazing intensity, their total area (pastures and rangelands) and spatial patterns were obviously different from HYDE 3.2 (Table 2). Thus, a better understanding of land use is vital to reduce the uncertainty of estimating N input rates and amounts in pastures and rangelands. Second, the FAOSTAT database provides country-level manure N applied to soils; however, this dataset could not be directly applied to study N cycles on pastures since applications to cropland and pasture soils are not differentiated. In this study, large uncertainty remains due to the fact that we separated national-level manure N application on pastures simply based on pasture area over total agricultural area (cropland, pastures and rangelands). In previous studies, Bouwman et al. (2013) assumed that 50 % and only 5 % of the available manure was applied to grasslands in most industrialized countries and in most developing countries, respectively. Liu et al. (2010) allocated 34 % of the national total solid manure to pastures in European countries and Canada, 13 % of the national total manure to pastures in the United States and 10 % of the national total manure to pastures in developing countries. Chang et al. (2016) assumed that manure N application rate changes along with changes in the total ruminant stocking density. Moreover, the spatialization process of N application rates might introduce large uncertainty. The spatial pattern of gridded manure N application rates in our study are correlated with manure production rates in Zhang et al. (2017). The assumptions and uncertainties mentioned in their study, such as without considering livestock migration, might cause uncertainty of spatial distribution. Third, studies used different data sources and made various assumptions of the annual amount of fertilizer N applied on global pastures (Bouwman et al., 2002; Chang et al., 2016; Lassaletta et al., 2014; Liu et al., 2010; Stehfest and Bouwman, 2006). Thus, there is a large uncertainty in the total N application on permanent meadows and pastures globally. Moreover, N fertilizer application rates by crops were highly investigated and documented in previous studies. Hence, N fertilizer application datasets were generated considering crop-specific fertilizer rates and cropland area in each grid (Lu and Tian, 2017; Mueller et al., 2012; Nishina et al., 2017; Potter et al., 2010). In reality, N fertilizer application on pastures of each country is not homogeneous. In this study, we assumed that N fertilizer application rate in each country was constant, which means fertilizer was applied evenly in each grid with a pasture area larger than zero. Last, inside each relevant land use cell pastures and rangelands may be characterized by different livestock density and deposition rates, which is not considered in our current datasets. The final manure N deposition would be highly affected by the proportion of each type of management in the grid cell. Thus, it is necessary to consider these in the future research. Furthermore, other human-induced sources of N inputs to pastures and rangelands were not included in our study, which may underestimate total N received globally. For example, biological N fixation was one of the major N sources in the terrestrial ecosystem in the absence of human influence (Cleveland et al., 1999). Pastures and rangelands occupy 25 % of the earth's ice-free land surface across different latitudes with divergent biological N fixation abilities. Plant production in temperate grasslands is proximately limited by N supply due to little N via N fixation; however, tropical savannahs received a large amount of N through leguminous species (Cleveland et al., 1999; Vitousek et al., 2013). An estimate of potential N fixation amount by global grassland systems is ∼46.5 Tg N yr−1, with a range of 26.6–66.5 Tg N yr−1 (Cleveland et al., 1999). Atmospheric N deposition is another major source of N input to permanent meadows and pastures globally and increased from 2 to 14 Tg N yr−1 for the period 1860–2016 based on the Chemistry–Climate Model Initiative N deposition fields (Eyring et al., 2013; Tian et al., 2018, 2019). The 0.5∘ × 0.5∘ gridded global datasets of manure nitrogen deposition, manure nitrogen application and nitrogen fertilizer application in grassland systems are available at https://doi.org/10.1594/PANGAEA.892940 (Xu et al., 2018). Data are in ASCII format. A Supplement is added to the list of all other parameters used in this study to calculate these three datasets in global grassland systems. In the context of increasing livestock production, manure and fertilizer N inputs to permanent meadows and pastures (pasture and rangeland areas) globally have increased rapidly since the industrial revolution. However, datasets of global N inputs are still incomplete. This is the first study that has attempted to consider major sources of anthropogenic N inputs in permanent meadows and pastures and hence generated time-series gridded datasets of manure and fertilizer N application rates and manure deposition rate during 1860–2016. Our datasets indicated a rapid increase of total N inputs to pastures and rangelands globally during this period, especially in the past half a century. The hotspots of grassland N application shifted from European countries to southern Asia, specifically China and India in the early 21st century, which indicated the spatial transformation of environmental problems. In this study, we have obtained N data from various sources to fill the data gap; however, large uncertainties still remain in our datasets (e.g., N application rate within each country, annual manure application amounts). More information is needed to improve these datasets in our further work. The supplement related to this article is available online at: https://doi.org/10.5194/essd-11-175-2019-supplement. This study has been supported by the National Key R & D Program of China (grant number: 2017YFA0604702, 2018YFA0606001), NOAA grants (NA16NOS4780207, NA16NOS4780204), the National Science Foundation (1210360, 1243232), the STS program of the Chinese Academy of Sciences (KFJ-STS-ZDTP-010-05) and SKLURE grant (SKLURE2017-1-6). We are grateful to FAO and its member countries for the collection, analysis and dissemination of fertilizers and land use statistics. We thank Wilfried Winiwarter from the International Institute for Applied Systems Analysis for constructive comments that have helped improve this study.